It amazes me that I still see divers who do not seem to have managed to master good buoyancy control. Ships float because they displace a greater weight of water than they weigh themselves. That’s because, although they are made of steel, they have a great amount of airspace within them. A man in a lifejacket floats for very much the same reason. Although, by and large, the human body is neutrally buoyant the additional flotation of the lifejacket tips the balance in favour of floating. Alas, our heads tend to be heavier than the water they displace, which means recently drowned people are usually found floating head-down so it’s important to wear the lifejacket in such as way as to support the head. As divers we contrive to be neutrally buoyant. That is to say we neither float up nor sink. We simply want to be able to go effortlessly in the direction we choose. Of course, some of our equipment is heavy whereas other parts would float it left on their own. The wetsuit, made of neoprene, if full of tiny bubbles of material that contain gas. Together, the aggregated effect of these floating and sinking parts usually results in a diver needing to add some ballast in the form of lead weights. The biggest influence on our buoyancy is our own lung volume. It can vary as much as six-litres by simply inhaling or exhaling. By controlling how much you breathe in or exhale you can make adjustments to your buoyancy far quicker than fiddling with some external device. If you find yourself starting to float up, exhale before adjusting your BC. Similarly, if you find you are descending more than you like, initially inhale a larger lung volume. When you learn to dive the instructor usually loads you up with more lead than you would otherwise need. This is because he needs you to kneel comfortably on the bottom while you learn new diving skills. New divers also tend to be a little anxious and that entails them breathing more heavily than they would do otherwise and big lung-volumes add buoyancy. Good instructors teach buoyancy control. It’s quite difficult to master this in the shallow water of a pool because the dramatic depth changes in the shallows has such a quick effect on the buoyancy of your suit and the expansion or compression of the gas in those tiny bubbles of neoprene. The same goes for any air in your BC. The net result is that few new divers master buoyancy control until they are diving in deeper water. 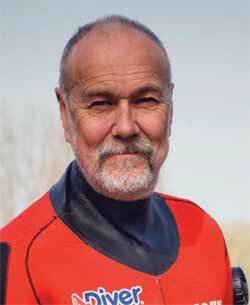 Too often new divers wear too much additional lead because that is how they originally learned. Dive guides the world-over spend their time convincing these over-weighted divers to shed some of this additional weight. A BC or BCD (buoyancy control device) is used to maintain neutral buoyancy at any depth. Do you know why it’s beneficial to use one? Would it surprise you to know that pioneers of diving such as those divers on Cousteau’s team didn’t bother? Well, they didn’t need to because they eschewed wetsuits. It’s the wetsuit that makes a BC necessary. With the thin wetsuits they used when they did use such things, these pioneer divers did all their buoyancy control by varying their lung volumes. As you go deeper, the integral bubbles in the neoprene of the wetsuit get compressed and your suit loses volume (along with insulation properties). This means you displace less water and appear to get heavier. You add air to a BC to compensate for this. As you ascend, you must release this air gradually in the same way. This brings us to drysuits. A drysuit has the ability to be fed with air just like a BC. You do this to keep its overall volume constant. If you contrive your weights so that you are neutrally buoyant in a drysuit just under the surface, you should be able to maintain that neutral buoyancy by keeping the suit at the same volume by adding small amounts of air as you go deeper and at any safe leisure diving depth. You don’t inflate the suit despite the valve being called the inflation valve. The air in the suit remains at the same volume but it gets denser as you go deeper, it gets compressed and you add more. Some say that air ‘sloshes around’. That only happens if you started with too much air in the suit when adjusting your weights for neutral buoyancy just under the surface. The term ‘inflation valve’ is misleading. You should not inflate the suit while under water. You should only maintain it at constant volume. Get your buoyancy right just under the surface so that you neither float nor sink whilst horizontal, with normal relaxed breathing and the minimum amount of lead, so that enjoy neutral buoyancy throughout the dive. By the way, the only real reason you need a BC with a drysuit, apart from the additional safety offered by its obvious redundancy, is to give you surface support in the right part of your body rather as with a lifejacket. As instructors if we want to stop over-weighting new divers, let’s stop teaching them to kneel on the bottom! I just made the switch in the last class I taught and while not astounding, the results were definitely positive. Students learned and practiced all skills in a horizontal position with only their fin tips touching the bottom of the pool. In the past most students wore between 4 and 8 lbs in the pool with no exposure suit. Without the requirement to kneel, almost everyone was wearing 4lbs with a few wearing 6lbs or nothing. It is true that you should take account of the mass of the gas you breathe, which is why divers with multiple tanks usually start a dive with air in their wing/BC in order to take care of this at the end of a dive. That last part simply isn’t true I’m afraid — or at least not practical or useful advice to a new diver — even with a membrane drysuit and no undersuit * (so nothing to crush under pressure). To see why you just have to think about your cylinder. If you dive with a 15L and use 150 bar of air during the dive then you’re going to have shed 2.25 kg of air during the dive. So if you start the dive neutrally buoyant you’re going to be doing your last safety stop finning downwards.